William (Bill) Andrew Helvig, 50, of Newnan, Ga. passed away Tuesday, June 12th. He was born in Kingston, Pa. on October 4, 1967 to Thomas and Judith Helvig. Bill Helvig, a resident of Peachtree City, Ga. since 1978, graduated from McIntosh High School and went on to receive a BS from Auburn University, a Masters Degree from West Georgia University, and a Specialist Degree from Columbus State. He was married to Pam Helvig on March 31, 2018. His passion for helping others was evident by his commitment to teaching, most notably as a High School Science Teacher with the Fayette County Board of Education, beginning in 1989. 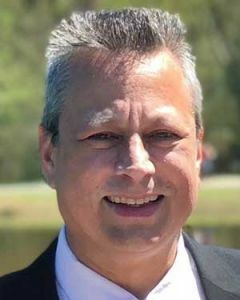 He has taught at several areas schools, including Fayette County High, Whitewater High, and his most recent assignment at Starr’s Mill High school. Bill, an accomplished Eagle Scout, greatly enjoyed spending time outdoors hiking, camping, and observing nature and wildlife in general. One of his greatest passions was college football, especially Auburn Football, which he looked forward to each season. War Eagle! Bill is survived by his wife, Pam Helvig; his children, Andrew & Abby Helvig; stepson, Cameron Phillips; his mother, Judith Helvig; sister, Karen (John) Krause and numerous nieces and nephews. Bill was preceded in death by his father, Thomas Helvig and sister, Kristen. Bill’s easy going spirit, his commitment to his family, and devotion to God was celebrated June 16, 2018 at a 2 p.m. service at Word of God Lutheran Church, 303 Kelly Drive, Peachtree City Ga. Expressions of sympathy may be made in the form of donations to Word of God Building Fund.